What’s not to love about baguette diamonds? These delicate step cuts bring Art Deco opulence to any ring and vintage flair to any finger! The recipe for a baguette-cut diamond originates from the hogback cut, an “elongated table cut” used as early as the 16th century. 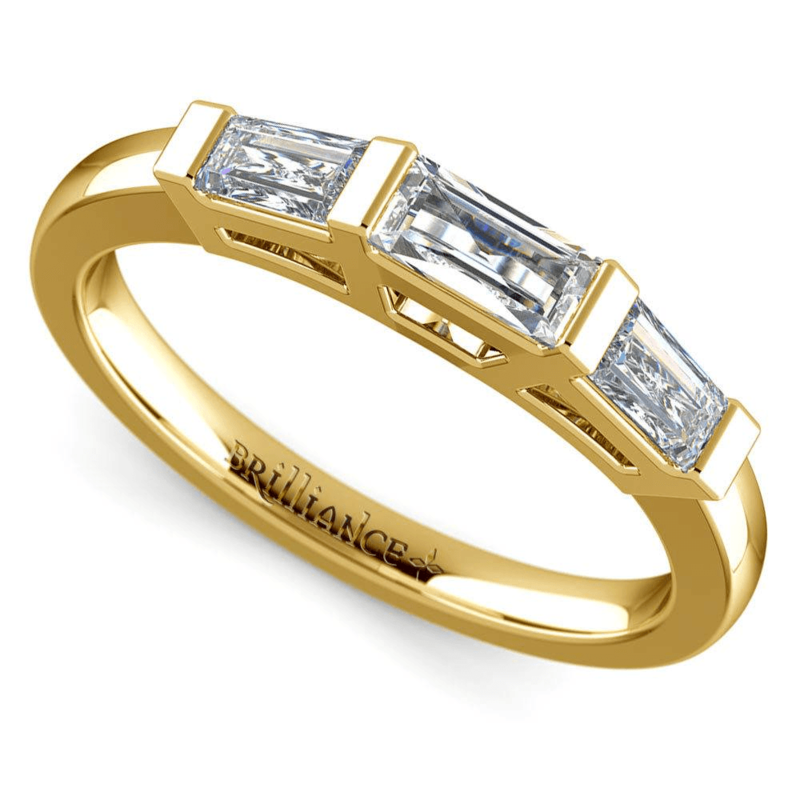 It became known as the baguette cut in the early 20th century, when it was brought into fashion by Harry Winston and Cartier during the height of the Art Deco period. Around this time, geometric patterns and streamlined forms were all the rage, and diamonds like the emerald and Asscher were in high demand. While the baguette may look similar to the emerald cut—both feature sleek, shiny step facets—the two diamond styles are very different. Unlike the emerald cut, which features angled corners, the baguette is cut with squared-off corners. Baguettes are also sometimes tapered at one end into a trapezoidal shape. 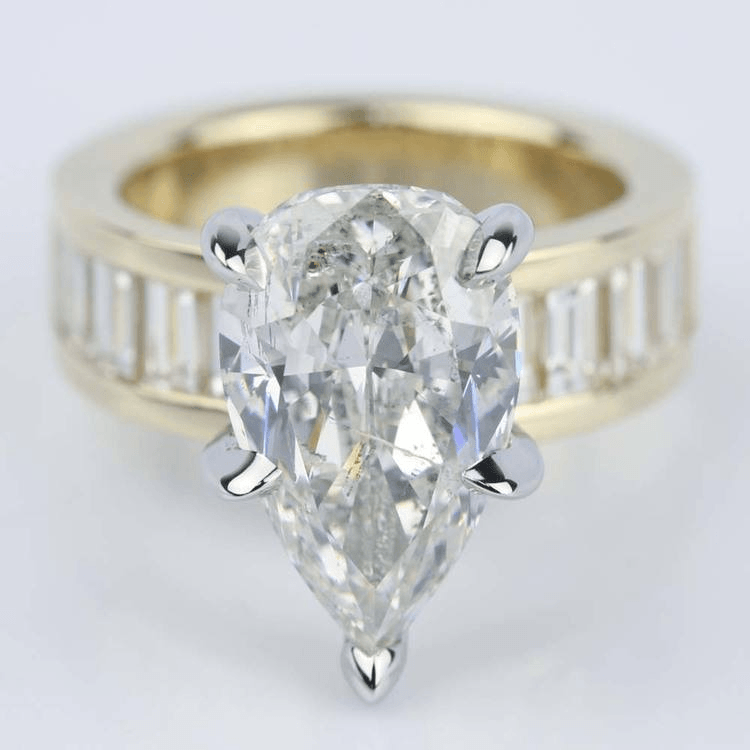 Baguettes are most often used as side stones or accent diamonds or, on occasion, in a halo setting. This is in large part because the long shape is easy to embed in a thin band, while their low facet count—only 14 facets—complements any diamond shape without distracting from the center stone’s beauty. While larger baguettes can be center stones in their own right, this is uncommon, so buyers may have to request a custom setting. Use baguettes to add a little vintage bling to your ring by mimicking the Harry Winston three-stone designs that made them famous. The tapered baguette works best for this, but the more angular the center, the better a straight baguette will look, too. 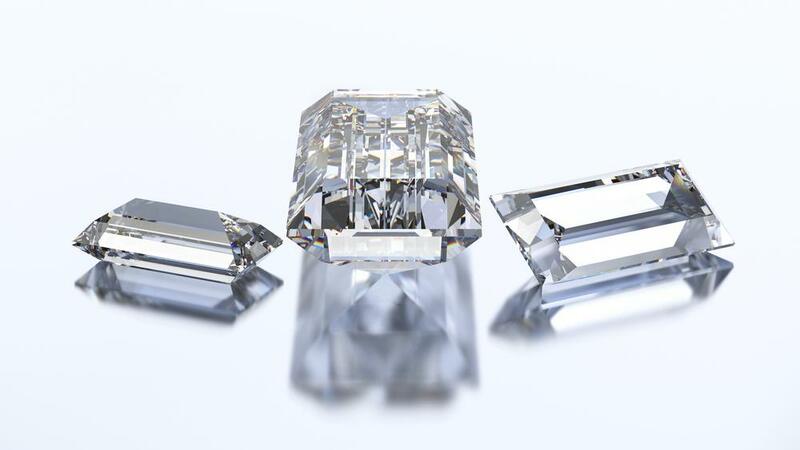 The GIA recommends that baguette side stones “match in length and width.” Keep clarity and color grades consistent with the grades of the center stone. Flaws in clarity and differences in color may be even more noticeable in bigger baguettes. 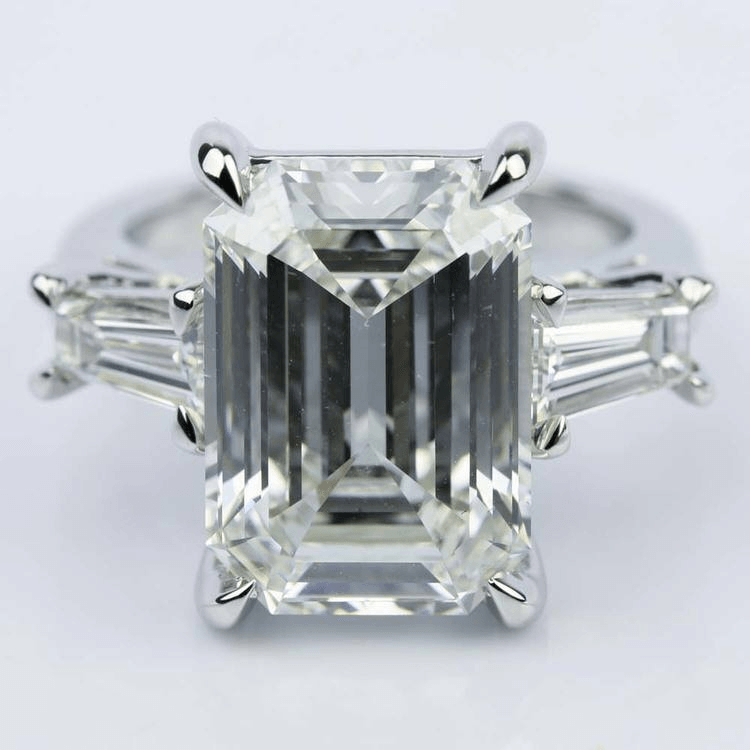 For buyers who are looking for a true Art Deco design, pair baguettes with other step-faceted cuts like the Asscher or emerald. Baguette-cut diamonds may also be embedded into the band in channel settings. When set vertically in the band (as pictured above), the diamonds will look like an endless row of mirrors, reflecting beauty and brilliance. Baguette diamonds may also be alternated with colored gemstones for a unique channel design. Most often done with straight baguettes, this look leans more toward the Cartier aesthetic. 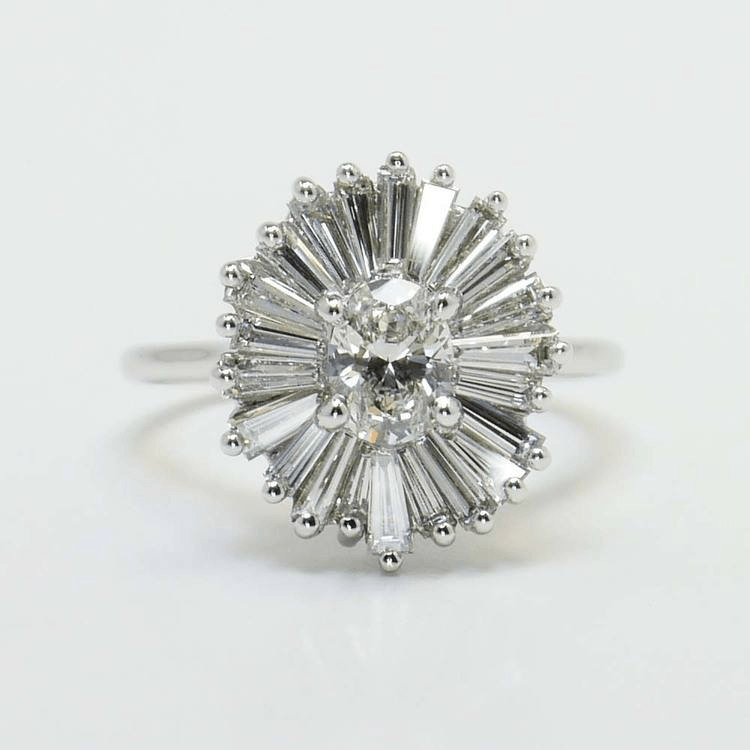 When arranged around a center diamond or gemstone, tapered baguettes create a beautiful halo that is often compared to a ballet tutu or dainty daisy. However you want to describe it, this design is perfect for brides with an appreciation for artistic splendor! Alternating the stone sizes and heights creates a dynamic ring like no other. Engagement rings don’t get to have all the baguette beauty. Eternity wedding bands featuring baguettes create a never-ending crown of diamonds that accentuate a solitaire engagement ring. Feeling bolder? Choose a wedding band with a trio of baguettes and opt for higher carats for optimal intrigue. 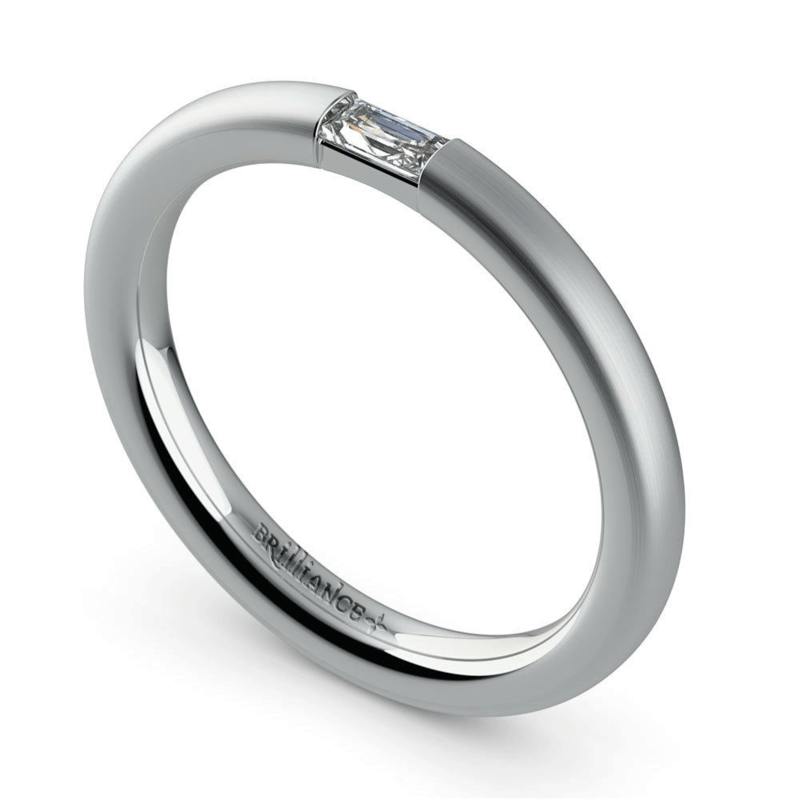 A slightly elevated setting like the bar setting allows more light to enter each diamond. Alternatively, take advantage of the shallow baguette cut to make the stones sit low into the band to fit under a fancy halo or with a low profile bezel ring. When couples use promise rings to symbolize a future engagement, they often favor more diminutive solitaires that won’t conflict with more sizeable engagement rings down the road. And, of course, many couples don’t want the promise ring to be mistaken for an engagement ring. Smaller baguettes make for a subtle yet chic solitaire. Baguettes are a great option for any diamond ring, whether you’re looking for sleek side stones, a unique shape for your eternity ring, or a petite solitaire for a promise ring. They can serve as the architecture for an artistic design or add an antique twist to a new ring. These delicious diamonds are the ultimate in versatility!